Another COP has come to an end, and this one yielded the Durban Platform, which involves phasing out the Kyoto Protocol by 2017 and replacing it with a truly global agreement that will be negotiated by 2015. It will take a day or two to really digest this agreement and then to distill out what it means for REDD. Throughout COP17, parties and negotiators will make daily progress on the different discussions central to the climate change agenda. The light at the end of this discussion tunnel is the agreement at the end of conference. To make sure you are updated on the latest developments in these negotiations, we will have daily updates on the Eko-Eco blog. 11 December 2011 | DURBAN | 0736 GMT | Another COP has come to an end, and this one yielded the Durban Platform, which involves phasing out the Kyoto Protocol by 2017 and replacing it with a truly global agreement that will be negotiated by 2015. It will take a day or two to really digest this agreement and then to distill out what it means for REDD, but we will try to post an update once we get stationary later today (Sunday). Below is the latest from Durban, South Africa and COP 17 – as posted on the Eko-Eco blog. Jump to specific days using the links below or scroll to the bottom to start from the beginning of the conference. 1002 GMT | There is some confusion over the latest LCA text, which, according to the Ecosystem Climate Alliance, has seven options for REDD finance. We are no longer at the UN compound, and will be relaying updates as we receive them from third-party sources. 0907 GMT | Attention has now shifted to the high-level talks, which are being adequately covered by the mainstream media. We will be in transit until Sunday, and hope to have a more reflective and comprehensive summary for you then. An official version is expected to be posted shortly. The text now goes to the COP, which will begin deliberations at 9am local time (0700 GMT). 1940 GMT | The formal negotiations for these texts have wrapped for the night, but bilateral and ndabo talks continue. REDD: LCA Negotiators are still locked in a closed-door session that also considers elements of KP (the “ndabo”). The text reportedly pushes all major decisions to COP 18 and contains vague commitments beyond 2012. Our sources say it has the backing of developed countries, while developing countries are pushing for a more concrete proposal. REDD: The text that’s almost on the table going into the home stretch here in Durban has been narrowed from more than five REDD finance options down to one – and Ecosystem Marketplace is privy to an under the table look at the results of some last minute compromise. Results-based approaches are at the top of the list, a big sticking point for US and some other countries’ support of REDD+. Regarding compromise language, unconfirmed countries put forth the text “…market based approaches could be developed by the COP,” to which Australia and Japan added the word “…including” (“…market based approaches could be developed, [including] by the COP”). The word “including” is one a few words still bracketed – so is the question of the level of MRV accountability (“…ensuring environmental integrity, requirements for robust [national] measurement, reporting and verification are met…”). Observers speculate as to whether the addition of “including” opens up finance to market based approaches outside of the COP or just more firmly reiterates its restriction to the COP. Considering the source of the addition – Japan, which has already bilaterally supported REDD+ feasibility-stage projects outside of the COP – it’s highly likely that the former is the case. Indeed, the text makes reference to a wide range of funding options, including market to non-market (fund-) based, bilateral and multilateral and alternative sources. As a caveat, though, you can reasonably expect some minor changes to the above text before it’s all said and done. LULUCF: The text that is prospectively going to ministers (still unseen outside of closed door sessions) leaves a few issues unresolved – issues that will likely be retained as bargaining chips for broader Kyoto Protocol debates. Will Annex I countries set their reference levels according to projected scenarios or decide to revert back to rules for the first commitment period? The latter option would continue to allow countries to “opt in” to accounting for emissions from managed forests and crop and grazing land. The former could enable them to establish scenarios that allow for large emissions increases in national inventories with potentially little consequence. Another question is whether or not they will require Annex I countries to account for both wetlands drainage and rewetting. There’s been discussion around allowing countries to only report wetlands draining but not include it in national inventories – meaning that they may have incentive to restore wetlands, but not to avoid draining them in the first place if they opt to not account for these emissions. Wetlands and managed forest sectors account for around 1 billion tCO2e annually. REDD: Ministerial negotiations are set to begin at 8pm local time (1800 GMT), with the AWG running concurrently. Still no official text for general distribution, but plenty of speculation as to what’s on paper and what isn’t. REDD: It’s dusk in Durban, and REDD talks are continuing under the LCA, with projections ranging from no text at all to a viable work program. “It would be embarrassing to negotiators and this process to fail to make any headway on REDD+ finance since Cancun last year,” says Jeff Fiedler, Senior Policy Advisor for Climate and Forests at The Nature Conservancy. Reference levels are the primary snag, with a split between countries like Australia and Japan, who want them explicitly mentioned, and others, like Brazil, pushing back. There’s buzz in the halls about a compromise on characterizing the different sources of finance, or a work program going forward — a prognosis that generally seems more like fervent hope than rational analysys. Fiedler says a more reasonable — and probable outcome — is the one championed by REDD SBSTA facilitator Tony La Vií±a (see below). Specifically: a work program with some combination of Party submissions, a Technical paper by secretariat, and an expert meeting. 1030 GMT | The Ecosystem Climate Alliance reports that financing sources have been dropped from the REDD text. REDD: On Wednesday night, The REDD text is now at five pages, with one veteran negotiator calling it the most bracketed mess he has ever seen. Though the text was expected Thursday morning, by 1012 GMT, no text had been released. LULUCF: Though we expected a text today, there are no details yet to report. REDD: Fearing that the LCA process will come to an end without chance to conclude REDD, the SBSTA REDD facilitator Tony La Vií±a implored delegates to come up with a work program that could keep the process going should LCA fail. That mean agreeing on four core elements: one defining potential sources of finance, one dealing with the content of the technical paper identifying effective sources of finance, one hosting an expert meeting and one mandating SBSTA to continue the process. When talk turned to a topic list for the technical paper, several parties – scores by one count – began loading it with their own pet projects, at which point chaos ensued. A text is due out in the morning, but is expected to be heavily bracketed. Update: Though expected earlier today, no REDD text has yet been released. LULUCF: Expect a text tomorrow – when it’s in, also expect to hear observer responses to the big issues: will the text opt for projected or historical baselines? Will accounting be consistent with other sectors under the Kyoto Protocol (several organizations say Option 3 – out of four available options – is the only one that passes this test). All of this depends, of course, on the presence of a Kyoto successor – and parties comment that there’s no obvious choice emerging among the existing proposals. Members of the French delegation and others report to Ecosystem Marketplace that right now it seems unlikely that a “gap” solution can be agreed upon in Durban that would prevent Kyoto from expiring without a replacement. Members of the AWG-KP are currently reviewing provisional fixes in case there’s no timely comprehensive solution. REDD: For REDD to work, the market needs clear guidance on how to establish reference levels, but the UN text is often incomprehensible to those outside the process — and even to those of us who are tangential to it, not to mention negotiators themselves. That’s why the Meridian Institute published “2011 Guidelines for REDD+ Reference Levels: Principles and Recommendations” in November. On Monday, they held a side event to shed light on the debate over reference levels and on the decisions we highlighted in yesterday’s blog. Commissioned by the Norwegian government, the report is part of a collection of reports that is meant to “support and inform UNFCCC negotiators and other stakeholders in the process of building an international REDD+ mechanism,” according to Hans Brattskar, the Ambassador of Norway’s Climate and Forest Initiative. It certainly seemed to, from the author’s comments as well as Tony La Vií±a’s assessment. “I think the report and its previous earlier versions contributed to unpack all of this for the negotiators such that by the time we were actually in Durban, many of the negotiators had actually mastered or knew how to talk about this,” says Levina, the facilitator of the SBSTA REDD+ Contact group, referring to the technical issues of reference levels. The report was developed by expert authors that the Meridian Institute convened; these authors then went through a consultation process with other experts. As the project leader Dan Zarin said in the side event, these reports were meant to aid SBSTA in responding to the request embedded in Annex 2 of the Cancun agreements to develop modalities for REDD+ reference levels and reference emission levels at COP17. However, as Zarin quickly pointed out, there is no official definition of reference level or reference emission level in an adopted UNFCCC text. For the report, reference emission level refers to levels of deforestation and degradation whereas the term reference level refers to these as well as sustainable management of forests, conservation and enhancement of carbon stocks. There were many similarities between the decision and the report;s ideas on reference levels. For example, Doug Boucher said that both documents use the same basic definition for REDD+ Reference Levels: they are business as usual baselines, developed using historic data and adjusted for national circumstances, against which emissions are compared. To develop these reference levels, the report recommended that SBSTA take a cue from IPCC and use their basic reporting principles. SBSTA listened, and included 4 out of 5: transparency, completeness, consistency and accuracy. Though they left out comparability, it was not for lack of discussion says Boucher. La Vií±a seconded that, saying that a longer discussion was needed around that issue in the next SBSTA meeting. One area that remains open for interpretation is the decision’s recommendation on the scope of REDD+ Reference Levels. The report recommended that SBSTA use IPCC’s basic categories of land use transitions: Conversion of forests to other lands; Emissions from and removals by forests remaining as forests and other lands that are converted to forests. However, Boucher says the negotiations did not clarify whether these would be used as the different categories for reference levels. Boucher thinks that SBSTA should agree to use these IPCC categories because they are simple and straight-forward. In addition, the IPCC has extensive guidance on how to estimate emissions and removals for these categories, he says. Beyond recommendations, the report also included guidelines for how governments should develop reference levels. Both the SBSTA decision and the report emphasized that definitions were a key step for developing reference levels. These would include, according to Sandra Brown, what percentage of canopy cover is considered a forest, the scope of activities and the pools included, the time frame for historic levels, and whether it will initially be within a national or subnational scope. Within the SBSTA decision, it is clear that countries need to have clear definitions of pools including explanations for pools they were excluding. However, the time frame for historic levels was not mentioned. Definitions are especially important because many countries transitioning to a national REDD+ system will have to integrate various sub-national strategies. This means, as Valerie Merckx pointed out, these sub-national strategies must follow the same steps as reference levels at the national level. The adoption of a reference level and any adjustments will be approved through an outside technical assessment. The report and the SBSTA decision are in agreement that the procedure for reference levels adoption is that countries will submit preliminary reference levels and issues will be discussed after a preliminary review, according to Merckx. There is still plenty in the report that SBSTA will need to talk about at their next meeting. For example, Merckx says that there will be a need to focus on the criteria of the technical assessment. Though he sees the hook for later discussion, Boucher also sees the need for SBSTA to continue to work on how the technical assessment is going to work: who will do it? What information will they consider? How will it be reported? To whom? And what happens next? REDD:Over the weekend, we saw the creation of two key documents: the SBSTA decision on reference levels and the formulation of that decision as an agenda item for this week’s high-level talks. Several delegates said the text provided enough guidance on reference levels for developing countries to begin moving forward, even though it fell short of the most optimistic expectations. A wave of optimism rolled through Forest Day on Sunday in Durban, as Tony La Vií±a, facilitator of the SBSTA REDD+ Contact group, offered an optimistic assessment of the SBSTA decision – one that several agreed. “This is the best REDD+ decision to come out of this process since the Bali Action Plan, albeit in a world of much lower expectations,” says John-O Niles, Director of the Tropical Forest Group. Others, however, say the text offers more of the same. He points out that a previous text, issued on December 1, offered precise guidance on a range of technical issues, including a clear definition of which national circumstances would be considered for establishing emission levels, and which would not. The current draft merely states that different approaches can be used. The decision also calls for consultations and expert meetings, but Seifert-Granzin points out that expert meetings were held last month, and they resulted in draft conclusions which were supposed to feed into this month’s talks. Instead, they were simply alluded to but not considered. Niles concedes the shortcomings, but says it’s the best we could hope for under the circumstances. He says that the level of specificity is good enough that developing countries can begin moving forward. We came in this morning expecting to top off a fairly optimistic curtain-raiser, but several other delegates are throwing a wrench into that assessment. LULUCF: Turning to the Kyoto Protocol track, LULUCF draft revisions are still ongoing. Of course, at this end of the ICC corridors, the biggest elephant in the room is the extension of the Kyoto Protocol. Most conversations around LULUCF are taking place as if an extension can be achieved or – as one party points out – are assuming that most decisions made here will hold even if there is no extension or a gap in binding agreements. “We’ve received legal opinions that everything about Kyoto except the legally binding targets can remain in force after 2012.” But most observers we’ve spoken with expect that there will be an extension or stop-gap solution of some kind – albeit Europe-sized. Three options for a successor of some kind are emerging in the AWG-KP, though IISD says there’s currently no consensus around any one option. So what to watch coming out of LULUCF talks today (Monday)? The spin off group looking at LULUCF under the Kyoto Protocol for developed countries meets this afternoon. As of Friday, no progress had been made regarding the Annex I “logging loopholes” that include allowing developed countries to “opt in” to accounting for forest management emissions and removals. Currently, around half of EU countries have chosen to report managed forest emissions under Kyoto Protocol Article 3.4 – in most cases, coming from those countries that stand to benefit from reporting. Convincing Annex I countries to account for all of their forestry activities region-wide and on a mandatory basis isn’t an easy task. It’s clear to observers that they will only capitulate if allowed to utilize projected reference levels as opposed to historical levels (ca. 1990). In a nutshell, this means that rather than determine business as usual (BAU) according to historical or even current levels, some parties want to include future projected emissions in their calculation of BAU. Because they also anticipate increasing their forest harvesting rates for the supply of bioenergy and other uses, setting BAU according to future levels accommodates an increasing rate of emissions. And if increasing emissions levels become BAU, this allows for increased emissions without consequence. Right now, a few countries (mostly developing countries) are working to produce alternative text that does not include projected reference levels. Unfortunately, observers report that the issue has become a trading card in the larger discussion about the fate of the CDM and Protocol – i.e. let us have projected baselines or we’ll just bow out of a second commitment period. Observers expect that the “logging loophole” text will likely remain intact until it’s passed onto ministers later this week. Odd as it may seem, negotiators appear to have made stunning progress on both REDD and LULUCF. We’re still checking a few things, and will post a full article early Monday morning. Closed SBSTA talks went late into the night as negotiators reworked the SBSTA language related to safeguards and reference levels after Brazil moved to push such talk back to the next SBSTA meeting. The most recent text, which came out Thursday morning, calls for the establishment of reference levels that can be adjusted in the future, but Brazil said it couldn’t sign off on anything relating to reference levels until interlinked issues are dealt with – such as agreement on how to anticipate drivers of deforestation. Several parties expressed outrage at Brazil’s stance, and accused them of deliberately trying to sabotage talks. Nils Hermann Ranum, of the Rainforest Foundation Norway, even speculated that Brazil was trying to sabotage REDD globally to benefit their own REDD market, which is fairly advanced. We had a dramatic day in Durban, with the SBSTA scientific sub-committee releasing a draft text on REDD+ that looked ready for Saturday’s plenary despite vocal criticism from developing countries, especially on safeguards and reference levels, but was then quickly called back. It’s now past 10pm, and the text is being redrafted almost paragraph by paragraph. We look for a complete redrafting of the sections on emission levels, and plenty of brackets on safeguards. We’ll offer a detailed analysis tomorrow. Meanwhile, we had another interesting discussion with members of the Bolivian delegation on their new “Living Forests” offset proposal. It aims to harness money from the Green Climate Fund to support indigenous activities in support of the forests. The payments won’t be market-based, but they would, by nature, have to be performance-based. “It’s not meant to replace REDD, but rather is something that can exist beside it,” said one member of the delegation. We’ve scheduled a meeting with the delegation tomorrow to get details, but given the late-night negotiations, it’s possible that won’t happen. Tomorrow should be a full day, with the new SBSTA draft and the LCA plenary. Stay tuned. Negotiators in the AWG-LCA agreed on Thursday to keep their REDD+ debate focused on those issues where agreement can be reached and blended with the text that SBSTA is developing on safeguards and reference levels – a decision that many in the halls described as kicking the tough stuff down the road. You’ll find a detailed summary on the IISD web site, and a brief bullet-point list issues on the Ecosystem Climate Alliance web site. Within SBSTA, the critical issue of how countries submit reference levels will be kicked down to an expert review. He gave high marks to SBSTA co-chair Peter Graham for whittling an ungainly mass of conflicting opinions down to something that has a chance of maybe one day becoming something that has meaning. He adds that progress on reference levels, information systems, and safeguards was promising – but other groups felt the safeguards were being pushed to the side. We’ll try and flesh this issue out as talks progress. Bolivia, meanwhile, offered to deliver an alternative to REDD – something we hope to flesh out later today. We also ran into Odigha Odigha in the halls, and he told us about a new “REDD University” that he’s working on together with John Mason and NCRC. They’ve apparently gotten some funding from UNDP, UNEP, and FAO, and technical support from Brazlian NGO Idesam. Stay tuned for details on that as well. REDD: The SBSTA contact group on methodological guidance met from 10:45am to 4:30pm to discuss guidance on reference levels, safeguards, and MRV, but details are slow to emerge. The afternoon session was open to observers, but conflicted with another meeting we were covering. Check back tomorrow for details on this one. LULUCF: The session was closed, but delegates say talks focused on a few key issues – key among them being which types of inadvertent releases of carbon should be counted against national totals and which should not. At issue is whether to recognize emissions from a force majeure or just from any “disturbance”, as is the case now. It’s a critical issue, because the wording could determine whether only pure acts of nature are recognized, or whether acts of nature that were made possible by man will also be recognized. We had a great chat with Fred Heutte of the Sierra Club and Susanne Tol of Wetlands International on this, and will post a more detailed summary on the EM Durban page tomorrow. Meanwhile, there’s still no agreement on how to define a forest (critics say the current definition is too broad) and little discussion on how to deal with peatlands – which account for just .3 percent of the world’s surface but are responsible for approximately 6 percent of global greenhouse gas emissions, according to according to Wetlands International. 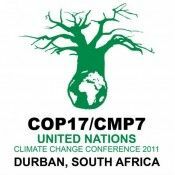 The 17th session of the Conference of Parties (COP 17) to the UNFCCC began on Monday in Durban, South Africa. Before the negotiations and side events get into full swing, here is a look at where discussions currently stand for some of the conference’s key issues. An in-depth look at the road to Durban can be found here. The Ecosystem Marketplace team will be on-the-ground throughout the conference, bringing you daily blog updates on these discussions, as well as feature stories on the largest developments. LULUCF: At the close of COP 16 in Cancun, the discussions around Land use, Land use-change and forestry (LULUCF)–a negotiating track focused on Annex 1 country (developed countries that joined the Kyoto protocol) future commitments under the Kyoto protocol–seemed to be regressing. Developing and developed countries could still not agree on the “logging loophole,” which lets developed countries pick and chose which activities they will and will not include in accounting, such as forest management, cropland and grazing land management. However, the negotiators did agree on one thing: each Annex 1 country would submit a forest management reference level to the secretariat. These levels could serve as baselines for LULUCF in the future and possibly inform a cap on developed countries use of forest management to meet emission reductions–a topic most likely to be debated this year. Though these negotiations have previously focused on extending the Kyoto Protocol–set to expire next year–the focus at this year’s COP will likely be what LULUCF will look like without Kyoto. The discussions are expected to include debates over the voluntary approach to LULUCF-related activities accounting and how much LULUCF activities will contribute to develop countries emissions targets going forward. REDD: The Cancun agreements demonstrated that some progress was achieved through the COP negotiations when it came to REDD. Though there were no definite commitments, the need for REDD was made clear. For one, the agreements stated the need for national REDD system to prevent leakage with sub-national systems acceptable in the interim as countries get up to speed. Secondly, the agreements said that developed countries would be responsible for funding REDD, although the exact financing mechanism – market-based or otherwise – has yet to be established and will be another point for discussion in Durban. The agreements also renewed a commitment to social and environmental safeguards. The issue of reference levels, and the related policy and technical issues of monitoring, reporting and verification (MRV), will be a central sticking point in negotiations, with the debate centering using on historic levels of deforestation versus expected emissions based on project reference levels. However, regardless of what happens at the negotiations, REDD+ and REDD readiness activities will continue to develop through the guidance of UN-REDD Programme, the Forest Carbon Partnership Facility and the REDD+ Partnership. Grab Bag: Beyond REDD and the extension of Kyoto protocol, expect COP 17 to contain discussion on the Green Climate Fund and Nationally Appropriate Mitigation Activities (NAMAs). Established in the COP 16 negotiations, the Green Climate Fund will manage the parties’ $100 billion commitment by 2020 to fund climate change mitigation and adaptation activities in developing countries. The COP discussions will focus on the structure and governance of fund as well as the source of the $100 billion. NAMAs are a voluntary way to continue to make headway on remission reductions through a variety of approaches to emission reductions at sectoral levels. While this definition has been agreed on, negotiators in Durban will discuss what NAMAs will look like in practice. Ecofys got an early start on this discussion, offering a database.